The plan view provides a graphical overhead view of the procedure and depicts the routes that guide the pilot from the en route segments to the initial approach fix (IAF). 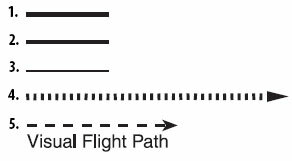 [Figure 1-10] During the initial approach, the aircraft has departed the en route phase of flight and is maneuvering to enter an intermediate or final segment of the instrument approach. An initial approach can be made along prescribed routes within the terminal area, which may be along an arc, radial, course, heading, radar vector, or a combination thereof. Procedure turns and high-altitude teardrop penetrations are initial approach segments. Features of the plan view, including the procedure turn, obstacle elevation, minimum safe altitude (MSA), and procedure track are depicted in Figure 1-11. Terrain is depicted in the plan view portion of all IAPs if the terrain within the plan view exceeds 4,000 feet above the airport elevation, or if within a 6 NM radius of the airport reference point the terrain rises at least 2,000 feet above the airport elevation. 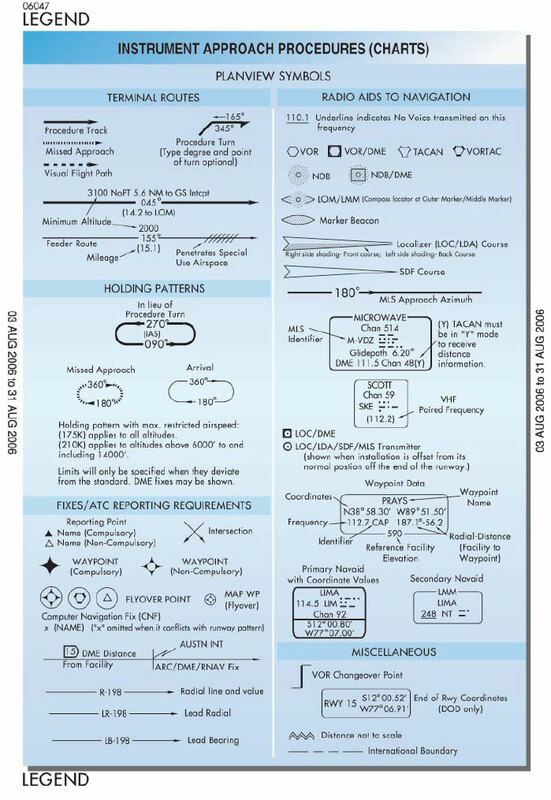 Some AeroNav Products charts contain a reference or distance circle with a specified radius (10 NM is most common). Normally, approach features within the plan view are shown to scale; however, only the data within the reference circle is always drawn to scale. Concentric dashed circles, or concentric rings around the distance circle, are used when the information necessary to the procedure will not fit to scale within the limits of the plan view area. They serve as a means to systematically arrange this information in its relative position outside and beyond the reference circle. These concentric rings are labeled en route facilities and feeder facilities. The primary airport depicted in the plan view is drawn with enough detail to show the runway orientation and final approach course alignment. Airports other than the primary approach airport are not normally depicted in the AeroNav Products plan view. 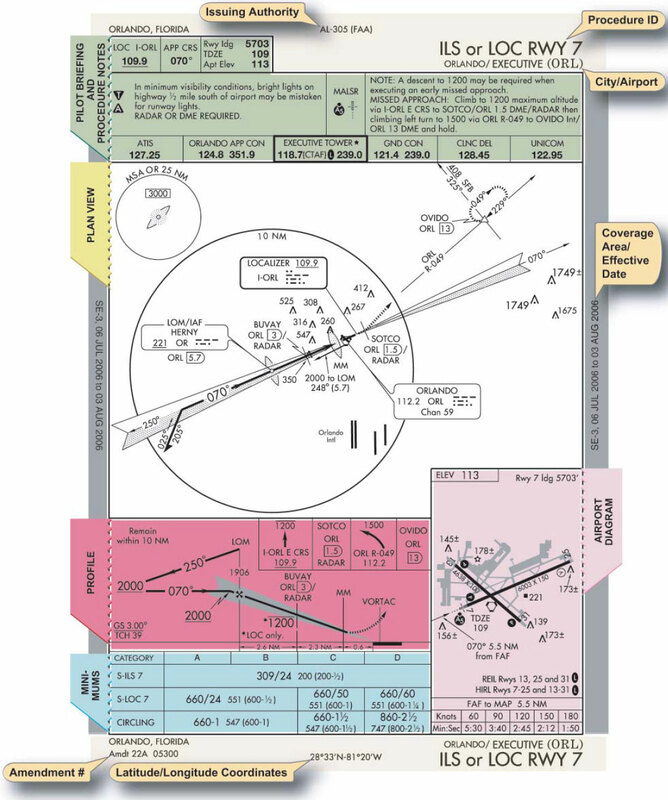 The MSA circle appears in the plan view, except in approaches for which the Terminal Arrival Area (TAA) format is used or appropriate NAVAIDs (e.g., VOR or NDB) are unavailable. The MSA is provided for emergency purposes only and guarantees 1,000 feet obstruction clearance in the sector indicated with reference to the bearings in the circle. For conventional navigation systems, the MSA is normally based on the primary omnidirectional facility (NAVAID) on which the IAP is predicated. 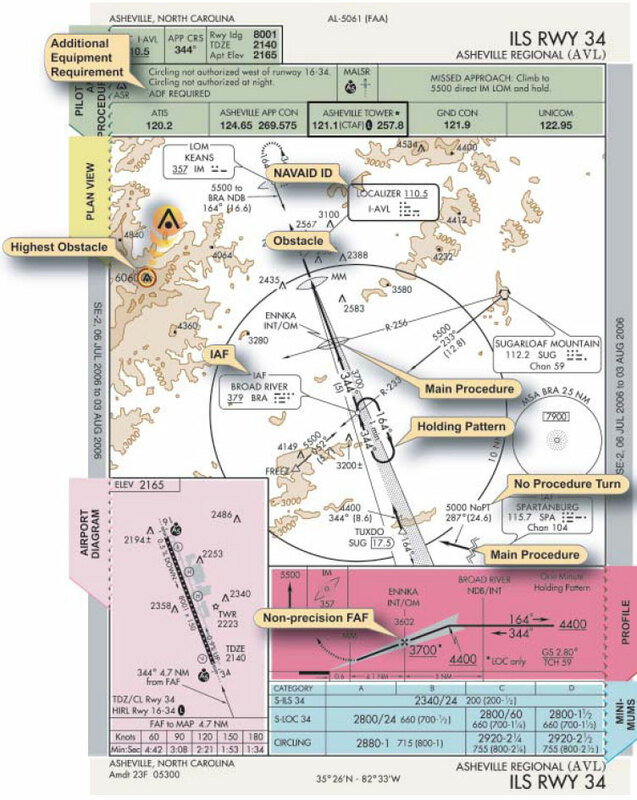 The MSA depiction on the approach chart contains the facility identifier of the NAVAID used to determine the MSA altitudes. For RNAV approaches, the MSA is based on the runway waypoint for straight-in approaches or the airport waypoint for circling approaches. For GPS approaches, the MSA center header is the missed approach waypoint. The MSL altitudes appear in boxes within the circle, which is typically a 25 NM radius unless otherwise indicated. The MSA circle header refers to the letter identifier of the NAVAID or waypoint that describes the center of the circle. NAVAIDs necessary for the completion of the instrument procedure include the facility name, letter identifier, and Morse code sequence. They may also furnish the frequency, Morse code, and channel. A heavy-lined NAVAID box depicts the primary NAVAID used for the approach. An “I” in front of the NAVAID identifier (in Figure 1-11, “I-AVL”) listed in the NAVAID box indicates a localizer. The requirement for an ADF, DME, or RADAR in the approach is noted in the plan view. Intersections, fixes, radials, and course lines describe route and approach sequencing information. The main procedure or final approach course is a thick, solid line. A DME arc, which is part of the main procedure course, is also represented as a thick, solid line (item 1 below). A feeder route is depicted with a medium line (item 2 beow) and provides heading, altitude, and distance information. (All three components must be designated on the chart to provide a navigable course.) Radials, such as lead radials, are shown by thin lines (item 3 below). The missed approach track is drawn using a thin, hash marked line (item 4 below) with a directional arrow. A visual flight path segment appears as a thick dashed line with a directional arrow. (item 5 below) IAFs are charted IAF when associated with a NAVAID or when freestanding. The missed approach holding pattern track is represented with a thin, dashed line. When collocated, the missed approach holding pattern and procedure turn holding pattern are indicated as a solid, black line. Arrival holding patterns are depicted as thin, solid lines.